The property has a quarter mile of direct access to the Big Hole River, and incredible privacy on 15 acres. This is a historic one room cabin that’s had the addition of two bedrooms and a full bath, turning it into a charming vacation home. This home has internet and a cell phone booster. 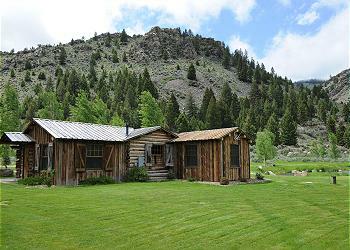 BRIEF DESCRIPTION: Big Hole Canyon Ranch is a fisherman’s dream. Out the door is access to the Big Hole River, a fisherman’s boat launch less than half a mile away, and a pond (not stocked) just off the deck all make for a great experience. The ranch’s beautiful hand-hewn log cabin has a rustic western feel but is appointed with top quality amenities and furnishings and is a very comfortable home base. Located on 15 acres in Maiden Rock Canyon this is both a prime fishing property and a great family or romantic retreat. Guests enjoy hiking and exploring on the property and on the adjoining Beaverhead Deerlodge National Forest. BEDROOMS AND BATHS: There are two comfortable bedrooms, one with a queen size bed, the other with two double beds. Great mattresses and high quality linens will make it hard to get up in the morning! There is additional sleeping space on a queen sleeper sofa in the living room. The cabin has one full bathroom with a stall shower. KITCHEN & DINING ROOM: The small kitchen is fully equipped, with high quality appliances including a gas range, coffee maker, microwave oven, a full size fridge, blender and all the cookware and serving ware that you’ll need. There is a dining table for four but where you’ll probably want to take your meals is outside on the wonderful deck overlooking the pond. OUTDOOR AMENITIES: Guests will find a built-in stone fire pit and plenty of outdoor furniture on the porch, a gas grill for barbecues, and Adirondack chairs and stone benches out by the pond and river. The river is just out the back door. The views are of natural, wild hillsides. Not another house or light in sight! For summer 2016 they'll also be adding an outdoor shower. (Note: The train goes through the canyon, across the river from the cabin, so you’ll see that go by a couple of times a day and the pond is no longer stocked). ACTIVITIES NEARBY: Fishing on the Big Hole River! You can launch a boat upstream and take out is just a stone’s throw downstream from the cabin at Maiden Rock. Because this take out is just downstream from the cabin, the only fishing boats you see going by are in late afternoon. The rest of the day the river out front is yours! The famed Beaverhead, Ruby, and Wise Rivers are also an easy day trip for fishermen. Enjoy walks on the property and on adjoining public land, and visits to local historic sites. For rock climbers, Humbug Spires is just a few miles away. There are no words to accurately describe this little piece of heaven. Just wish we could have stayed forever! Overall this cabin was great. Loved the porch and the location. We did have an issue with the hot water... felt like the instant hot water heater was not working. The shower was a trickle with the pressure and it was either freezing cold and burning hot. Everything was superb! Great location! Great townhome! Had everything, and then some, that you needed. Would recommend it to anyone. Only thing I would have preferred was air conditioning. It did get a little warm during the day. We were there when it got up to 80's and 90's. Honestly, this was the most incredible vacation ever. Our tranquility started the second we got off the freeway on Moose Creek. The closer we got to the cabin, the more we smiled. The kids loved the pond and river, the dogs loved the vast land, and my wife and I loved the early morning briskness drinking coffee outside with the beautiful, scenic water and mountain views. We had the pleasure of meeting the caretakers Joan & Shawn, both are amazing people and Shawn shared a plethora of knowledge/history of the area. 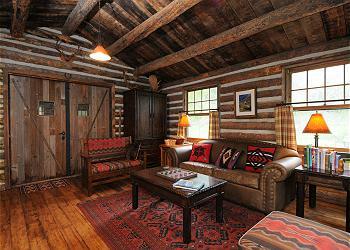 This cabin let us enjoy each others company, rather than the technology we are all addicted to. We will 100% be back, again and again. Extraordinary place! We loved everything about this place....the house, the impressive ease of working with mountain home, the location, the river, the fishing...Our only complaint is not being able to stay longer. Plan to go back!! Thank you for your wonderful review of Big Hole Canyon Ranch and Mountain Home Vacation Rentals! We are so very glad that you enjoyed the home, the location, and working with our staff. We hope to see you again in the future! Thank you so very much for your wonderful review of Big Hole Canyon Ranch and Mountain Home Vacation Rentals! We are very glad that you had everything you needed for a comfortable and peaceful vacation. It is our goal that all of our homes are well equipped and and that guests have their needs met. We do hope to see you another time! This is our 3rd rental with Mountain Home and it was a wonderful experience. Very private and peaceful. Saw moose, geese, pheasant and 5 bighorn sheep. The caretakers are attentive and helped me figure out how to get the oven going, and replaced the can opener, which broke as I was using it. We were disappointed that there were no trout in the trout pond, but it was not a deal breaker. The river is just down from the cabin. We were the first guests of the season, and the river was too high to wade fish by the cabin. We would love to return in September when the water is lower. 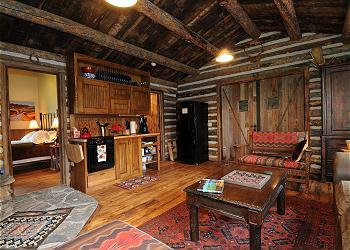 The cabin was cozy and very clean. Loved the automatic gas fireplace. Thank you very much for your great review of Big Hole Canyon Ranch and for using Mountain Home Vacation Rentals for a 3rd time! We love having return guests that come back year after year. Thanks again and we hope to have you return a 4th time!